The Dental Schools Council, which represents dental schools across the UK and Ireland, has elected Professor Chris Deery as its new Chair. Professor Deery is Dean of the School of Clinical Dentistry at the University of Sheffield. On his new role, Professor Deery said “I am delighted to be taking over the position of Chair of the Dental Schools Council. We have seen great strides in public dental health over the last decade and these strides are in large part down to the quality of our dental school graduates. We must ensure that the high standard of our teaching and training is maintained and that dental education continues to speak with a strong voice. “A key issue for dental healthcare is research. We must increase opportunities to conduct research and this includes providing support for those who work in clinical academia. As the recent clinical academic staff survey has shown, progress is being made and we are seeing an increase in the number of dental clinical academics. But more must be done and this will require combined work from organisations across the sector. Professor Deery was appointed Dean of the School of Clinical Dentistry at the University of Sheffield in 2015. Having joined the university in 2006 as Professor of Paediatric Dentistry, Professor Deery has held several roles within the school including Deputy Director of Learning and Teaching, and Theme Leader for Intermediate Oral and Dental Care. He is currently Programme Director for the MClinDent in Paediatric Dentistry. As well as his teaching responsibilities, Professor Deery is an Honorary Consultant in Paediatric Dentistry at the Charles Clifford Dental Hospital where he has also been the Clinical Lead for Paediatric Dentistry and the Associate Clinical Director Charles Clifford Dental Services. He is currently Editor-in-Chief of the International Journal of Paediatric Dentistry and Chair of the Consultants in Paediatric Dentistry Group. He succeeds Professor Callum Youngson, Head of the School of Dentistry at the University of Liverpool, who said “I have thoroughly enjoyed my time as Chair and I wish Chris all the best in his new role. 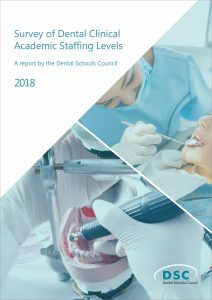 The survey referenced by Professor Deery is the Survey of Dental Clinical Academic Staffing Levels 2017. To learn more about the issues surrounding recruitment to dental clinical academia, see the recent DSC article Factors in expanding the clinical academic workforce. The Dental Schools Council is the authoritative voice of the dental schools within universities across the United Kingdom and Ireland. Its Chief Executive is Dr Katie Petty-Saphon.